Nice shot of the catapult launch from the Arrowplane (Arrowcar!) 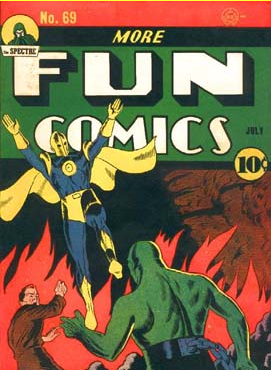 on the cover of More Fun 78 (April 1942). 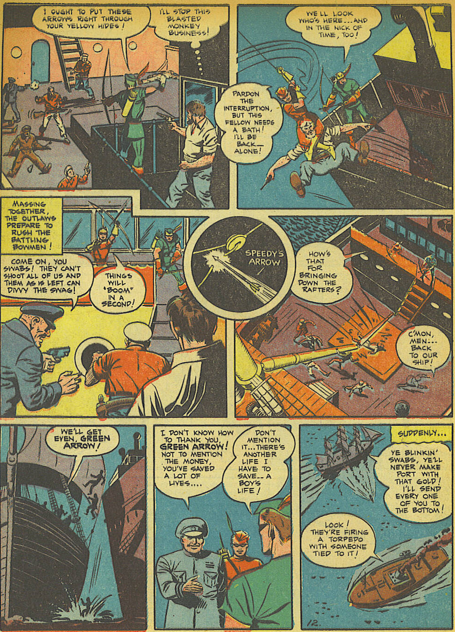 The story has to do with a modern day pirate, the Black Raider, and introduces Green Arrow’s boat, the Arrowcraft. 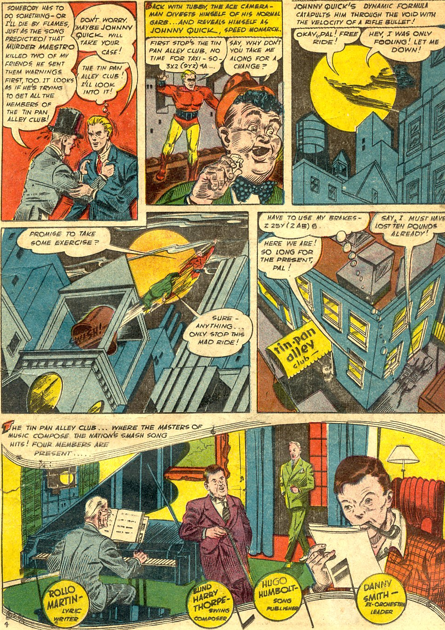 The little bit we see of Oliver and Roy’s apartment (the first two panels above) is about all we ever see. No real context to their lives. Again, a decent but largely forgettable story. 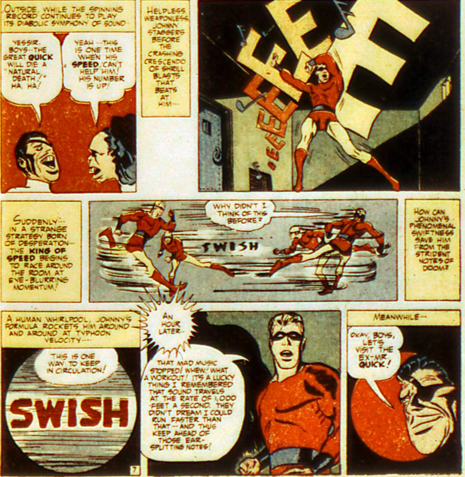 I do like the little insert close-up of Speedy’s shot on one page. Murders and a Wax Museum make this an entertaining read, for a late Dr. 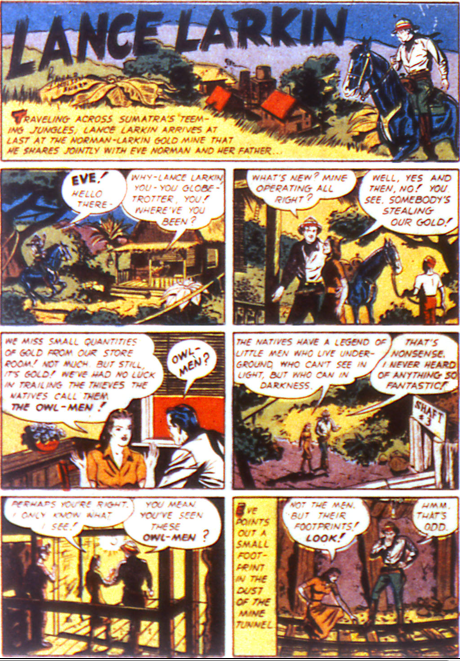 Fate story, by Gardner Fox and Howard Sherman. The villains are just a gang of thieves, but they dress up as characters from a wax museum to confuse the police and scare people. 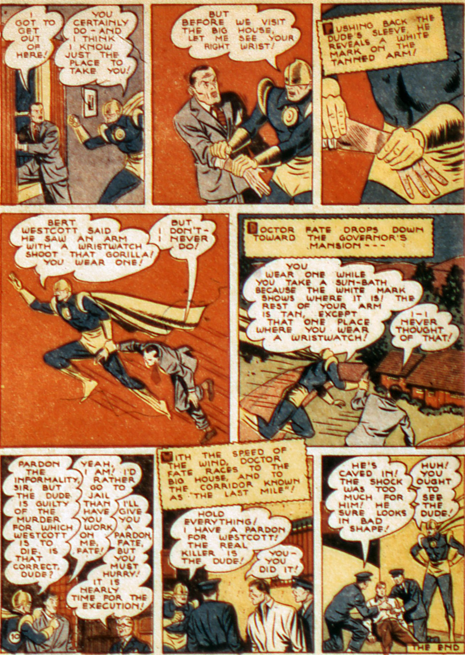 Inza and Kent are at a society costume ball that they attack. Fate gets captured, and put into a glass chamber to suffocate. That dratted half-helmet again! No magic to escape, purely strength and ingenuity. This series has all but given up on the supernatural. 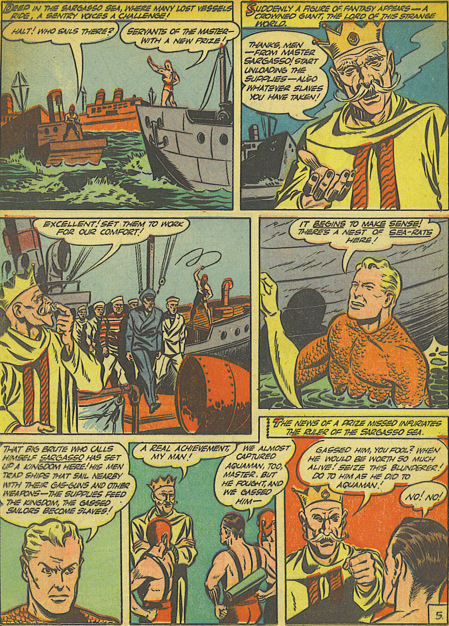 Aquaman deals with a self-appointed King of the Sargasso Sea in this story. The man has made his kingdom of abandoned boats, and populated it with wanted felons. It’s really not a bad idea for a recurring villain, but this guy was just a one-shot. Still, this one almost didn’t make it into the blog, until I hit the last page. 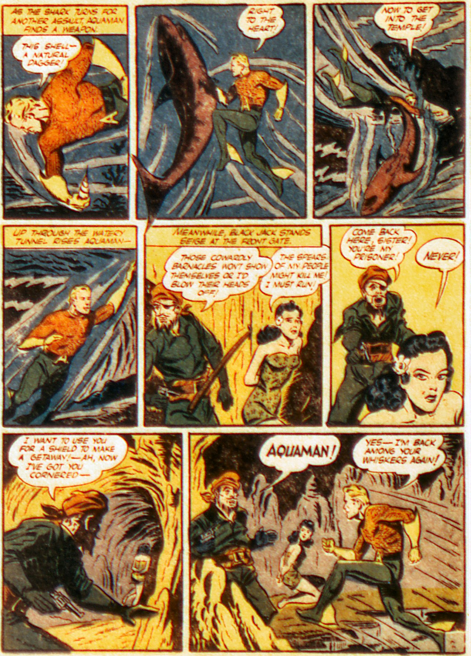 Aquaman has no problems blowing the king up, and in the last two panels defines his mission, but looks so amazingly happy doing it. Dr. 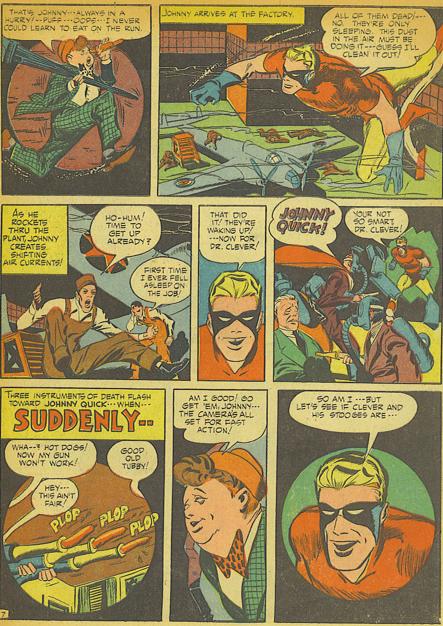 Clever has his third outing against Johnny Quick in this story, illustrated by Mort Meskin. Johnny’s mask alters in this one as well, gaining some width on the side that really helps define the character’s face. The story has Dr. Clever calling himself the Man of a Million Murders, but that was the “title” used by Mr. Zero a number of months ago. As Mr. Zero never appeared again, it would seem that Dr. Clever likely killed him, making him one of the numbered deaths, and then continued his scheme. A lot of things happen SUDDENLY in this story, but its fun. 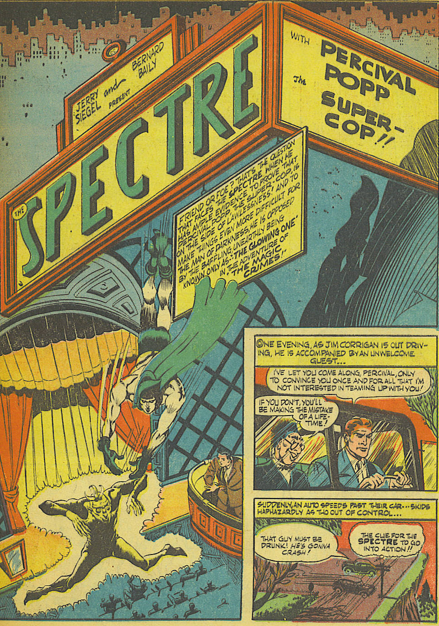 Jerry Siegel and Bernard Bailey find an almost comfortable mix with the Spectre and Percival Popp in this story, as they pursue a spirits who emerge to rob the audience during a magician’s show. 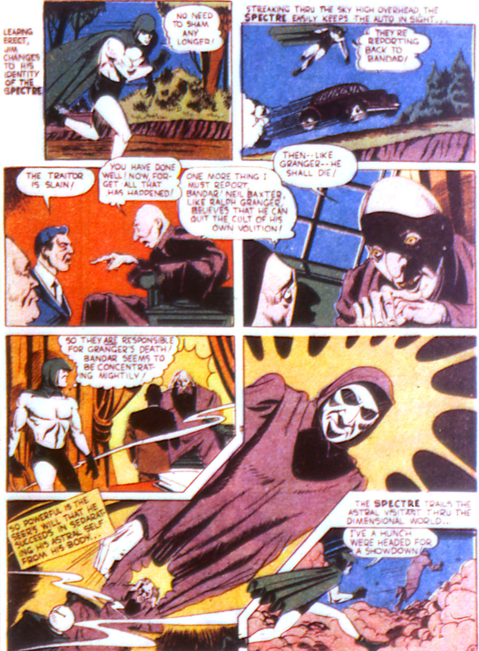 Popp basically just acts as Jim Corrigan’s sidekick through this, off to the side while the Spectre investigates the mystical side to the case. Of course, the magician is the real culprit. They always are. 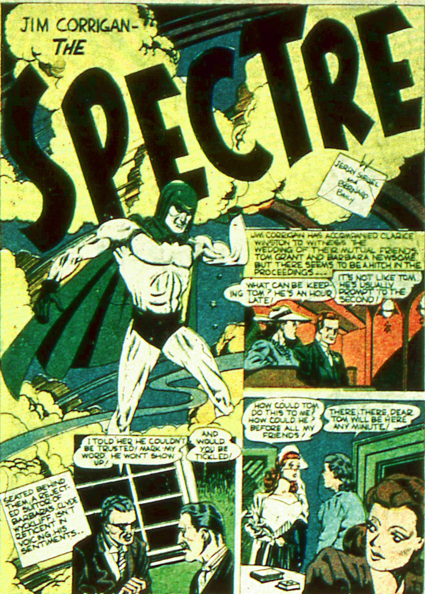 But the Spectre gets to show off some of his powers at least. 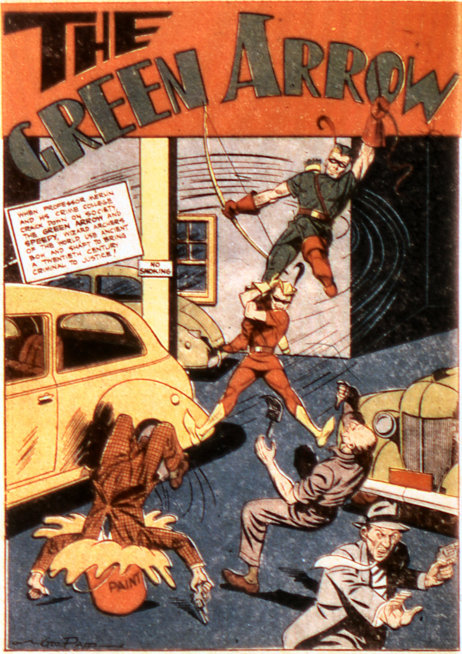 Green Arrow and Speedy get the cover, and the lead spot, beginning with More Fun 77 (March 1942). 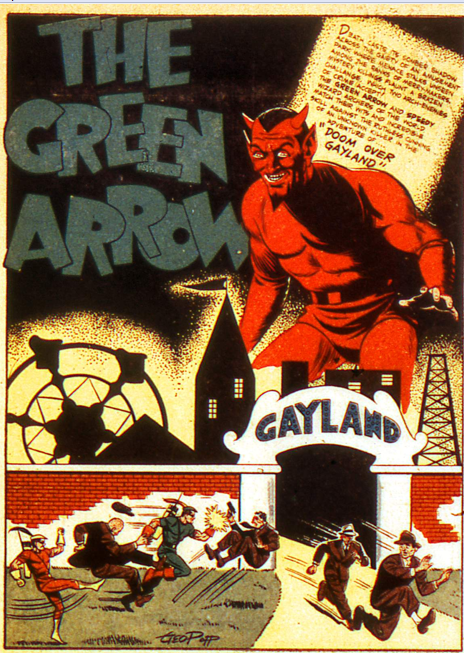 With the title of the story, and a huge devil over the Gayland sign on the splash page, I was expecting to have a lot of fun with this Green Arrow story, finding unmeant innuendos in the dialogue. But alas, that was not to be. After this first page, the name of the park is never referred to again. It’s a decent enough tale. 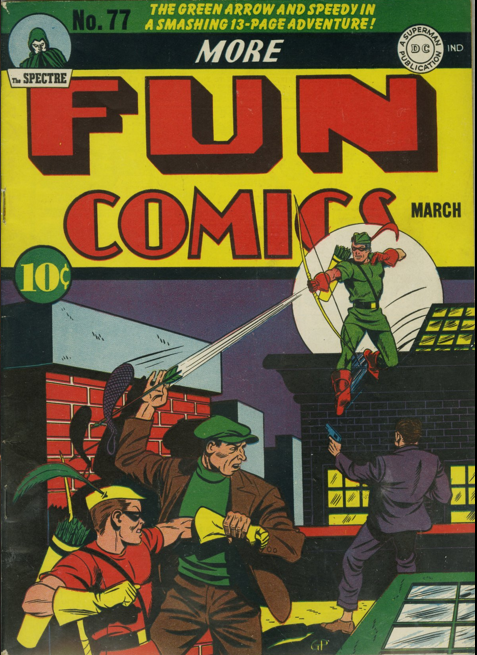 Criminals dressed as red devils are plaguing an amusement park, so Green Arrow and Speedy battle them. The roller coaster sequence is the only part that uses the rides as backdrop. 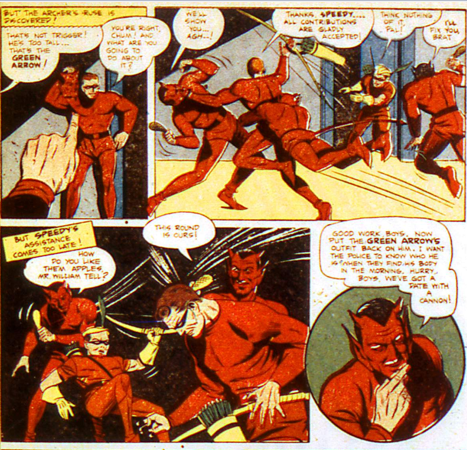 Green Arrow infiltrates the gang, disguising himself as a devil. 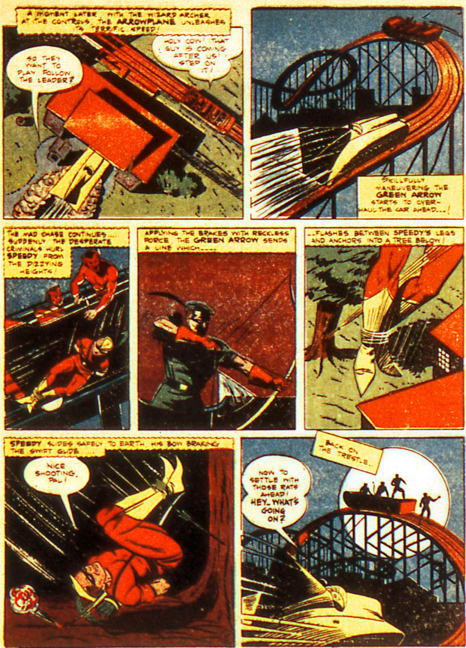 So much red on that page, with Speedy in the mix. No trick arrows or anything special about this one, though. Dr. 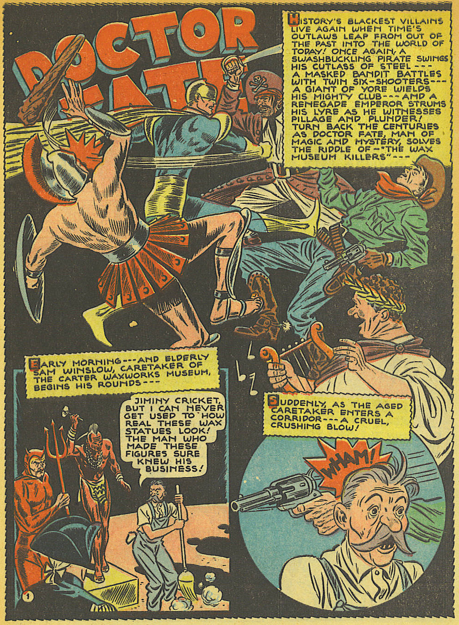 Fate moves a little towards the mystical in Jerry Siegel’s story, and Howard Sherman does a good splash page. Inza functions to draw attention to the problem, her usual role. Dr. Fate is dealing with a painting that is a portal to another realm. Sadly, despite it being called strange, it looks pretty much like the world around us. At least Dr. 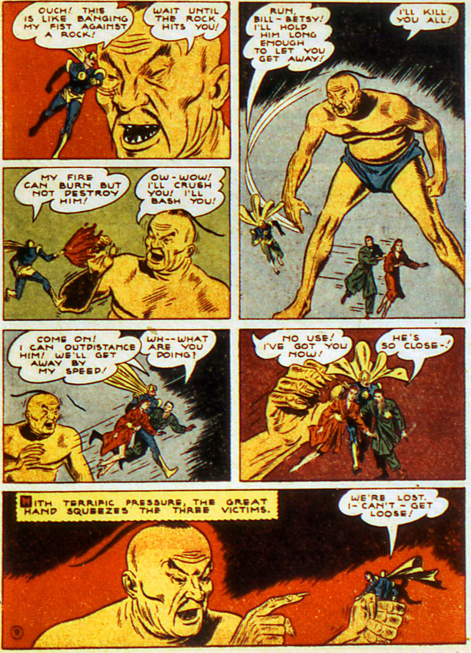 Fate gets to fight a giant, although he just resorts to punching him, as he tends to these days. 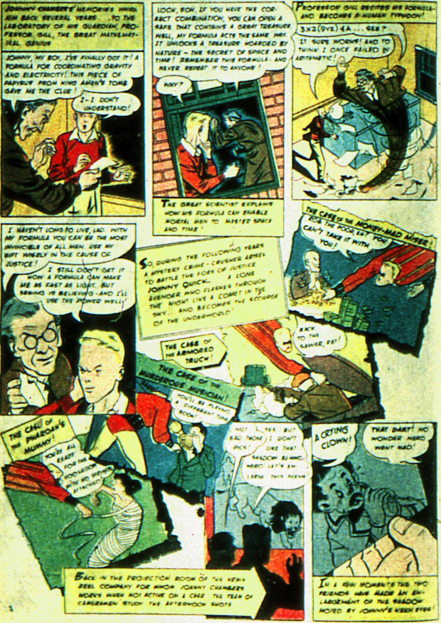 Black Jack makes his third appearance in this tale. For a recurring villain, he never seems very competent. This story sees him running a crooked casino on a ship outside the legal limits. Aquaman has his first scene out of his costume, and he’s in a snazzy white suit! Splashing him in the face! Yup, one good splash is all it takes to bring this villain down. Remarkably, Black Jack returns in a few months. 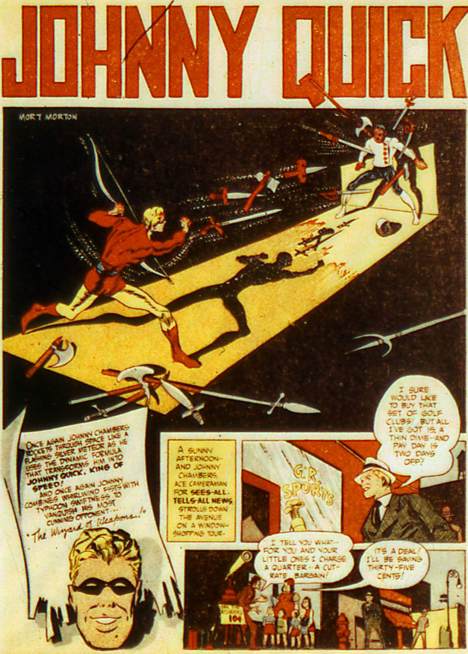 There is some nice Mort Meskin art on this story, and a significant development in how Johnny Quick’s powers are shown, but the main thing I want to talk about with this story is the screw up with the names. OK, so here is Tom Mason. See, he calls himself that. 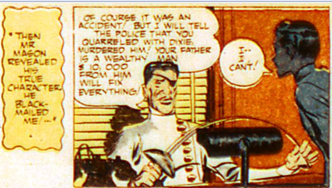 Poor kid was trying to kill himself when Johnny intervened, and learns how he killed another boy in a duel. And in flashback, here is the duelling master (and real villain in the story), Mr. Douglas. 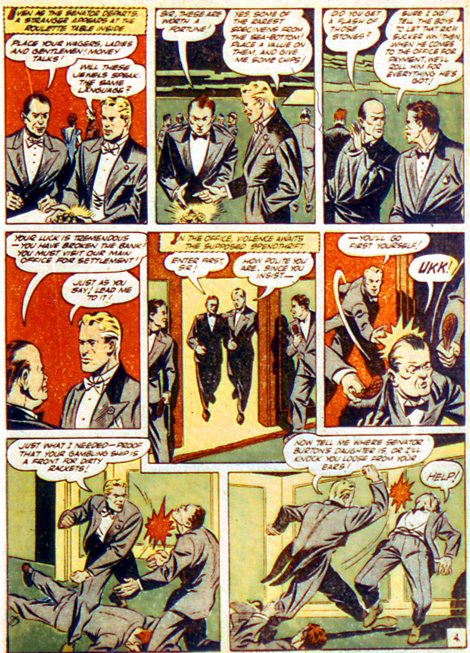 The apparent duelling death is in the last panel. 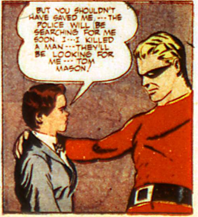 And then, on the very next page, the duelling master is now called Mr. Mason, and will continue to be called this for the rest of the story. Really bad error, shame on the editor for not catching it. Unless secretly the duelling master is Tom’s real father, banished from the family long ago. He changed his name, lost and eye, and became a duelling master simply to pull this evil scheme on his unknowing child. Yeah, let’s go with that. Improves the story. An enjoyable fight between Johnny and Douglas/Mason, but no strong visual for the super-speed yet. 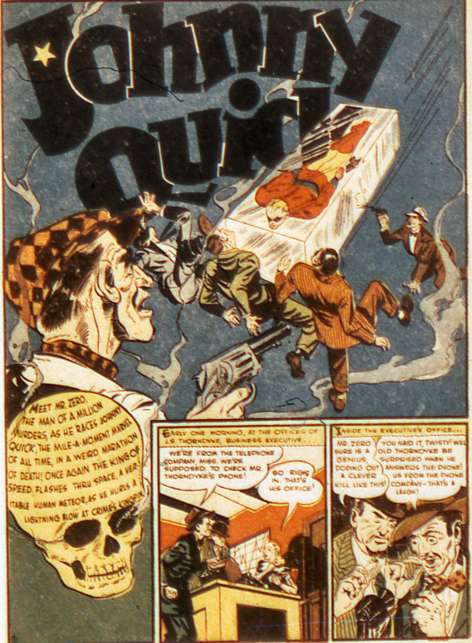 And then, amidst some clever stylization of words and images, Meskin first uses the visual that will come to define this series – a panel that shows multiple images of Johnny at once. Here that is mixed with speed lines, and likely was not intended to inaugurate a new way of showing speed. But it was the start. 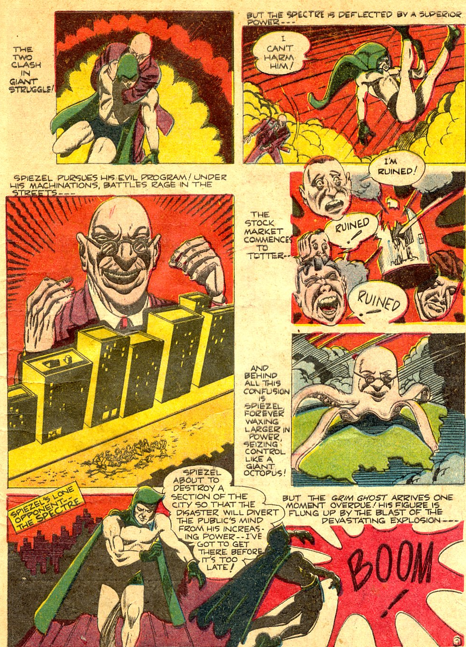 The Spectre story in this one is a welcome change. It’s back to the old for Jerry Siegel and Bernard Bailey, and there is no Percival Popp in sight. 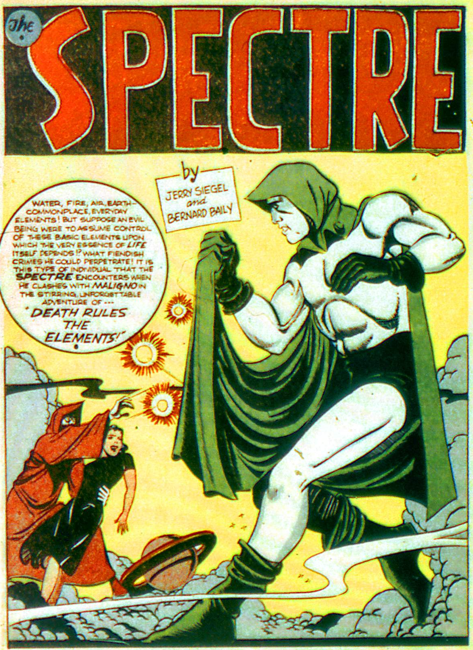 Great splash page, showing the Spectre off better than most issues do. 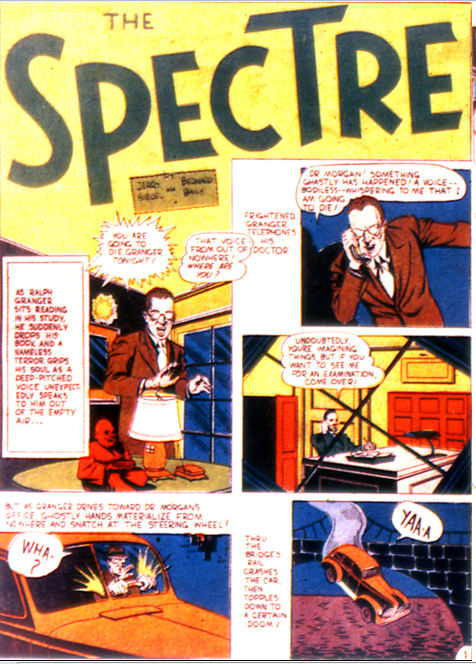 The story is a bit of a let-down, only in that is so much of the formula of Spectre stories before the change. Maligno is another malevolent spirit, once again wearing the purple robes that are the mandatory garb for nasty ghosts. There is a touch of cosmic stuff, but nothing huge or dramatic. A step back to the better days, but only a baby step. The Dr. 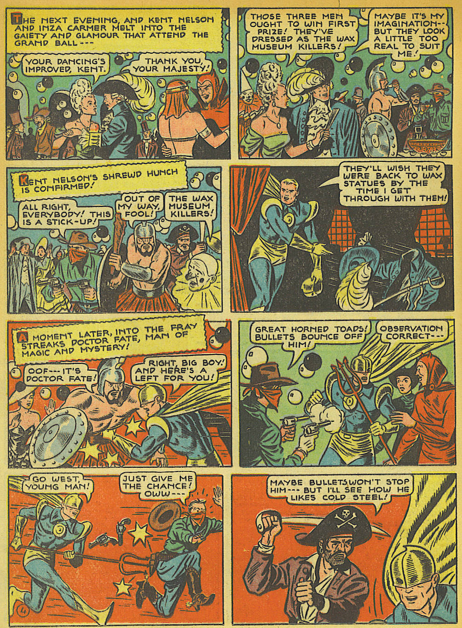 Fate story in More Fun 75 (Jan 42) is by the original team, Gardner Fox and Howard Sherman, but little of the original feel of the series remains. It does open as a typical story. 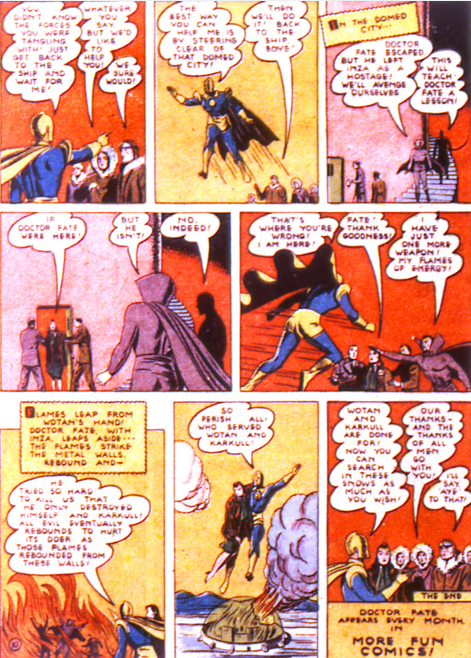 Inza needs Dr. Fate’s help with a friend imprisoned for a crime he did not commit. Dr. Fate uses his crystal ball to learn of Inza’s need, but from there on this is pure down to earth stuff. Fate tracks the gang, beating up all the members along the way. The story is nothing but a loose frame work on which to hang scenes of Dr. Fate hitting people. Nor does the mastermind require anything magical to take him down. Dr. Fate flies, but shows off no other degree of special powers. 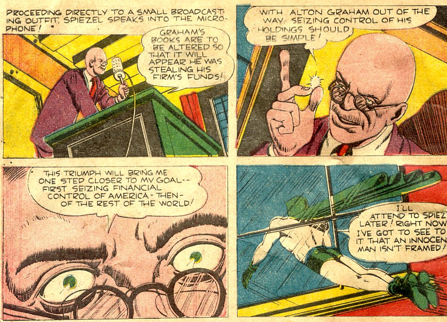 Green Arrow gets his first recurring villain in this issue, who goes by the name of Professor Merlin, but also calls himself simply Merlin. He runs a crime college, sending his “students” out to steal cars. 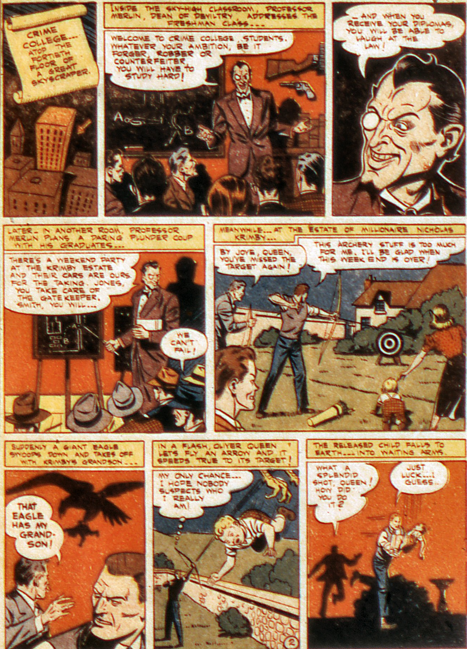 His men capture Green Arrow and Speedy, but Professor Merlin is impressed by the archer, and asks if they can join forces. Pretty foolish, really. 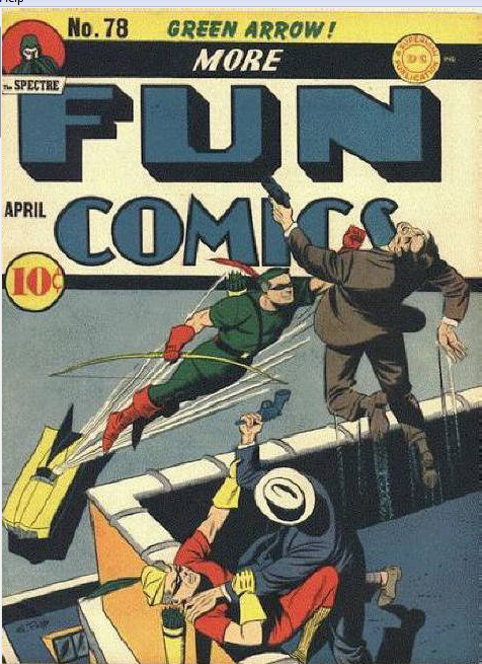 Of course Green Arrow agrees, but simply sets him up and takes him down. Merlin does manage to escape, vowing revenge. And he returns, the following month, in Leading Comics 1, the first story of the Seven Soldiers of Victory, to fight Green Arrow. 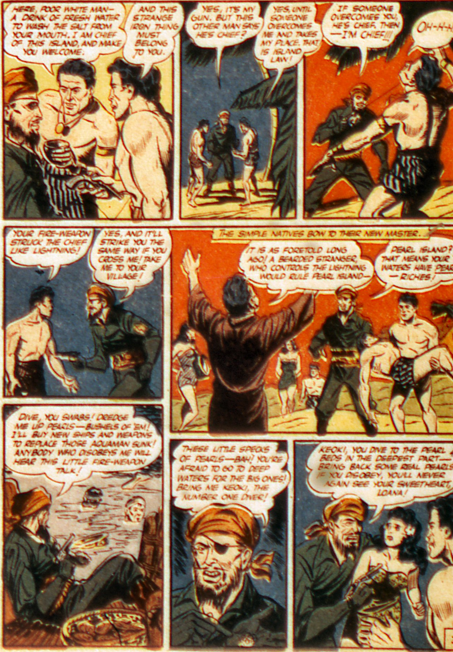 Aquaman’s story has him aiding some south seas islanders whose home has been conquered by Black Jack. The area is rich in pearls, but Black Jack also has designs on Loana, the girl friend of Keiko. 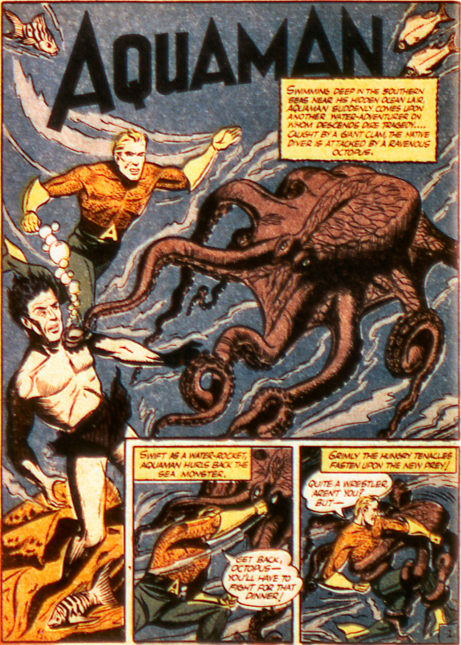 Keiko is the guy Aquaman rescued from the giant clam, and learns all the backstory from. 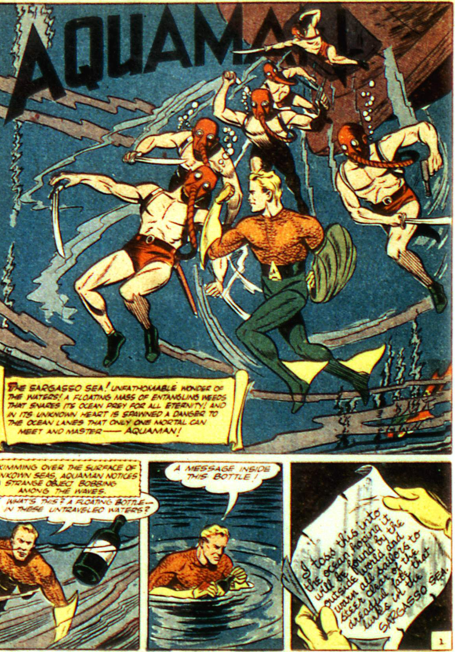 Interestingly, to get to Black Jack, Aquaman has to fight and kill a shark. He does not even attempt to mentally control the creature. Of course he succeeds, and frees the island from Black Jack’s control, although the villain returns a couple months down the road. 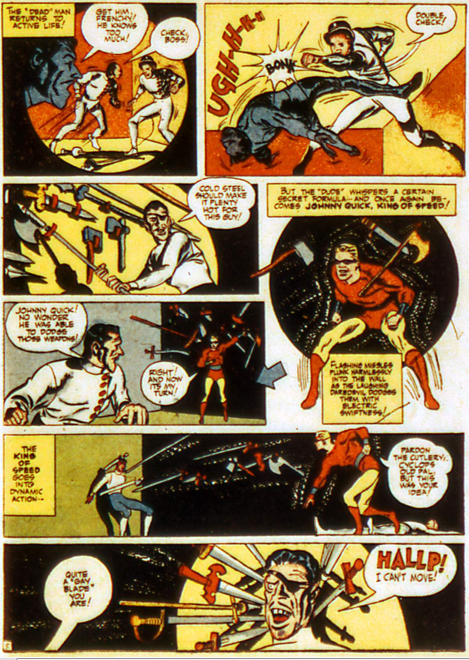 Johnny Quick faces a mass murderer in this story, with great art by Jerry Robinson and Mort Meskin. Mr. Zero has a skeletal face and head, and a tendency to kill of even his own henchmen. Johnny Chambers and Tubby Watts are filming at a baseball game when one of Mr. Zero’s men kills a guy, getting Johnny onto the track of these guys. This brief scene pretty much establishes the way they will often be introduced into the story, the matching green suits. Tubby’s hair has changed colour from dark brown to red, and his face altered slightly as well, into what would become his standard appearance. Lots of speed action, but still a costume that lacks a defining symbol. 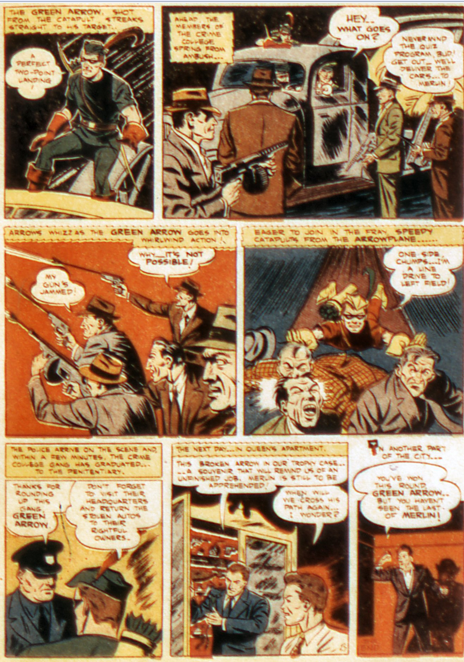 Some more big changes occur in this story by Jerry Siegel and Bernard Bailey. Percival Popp is still trying to worm his way into Jim Corrigan’s life. 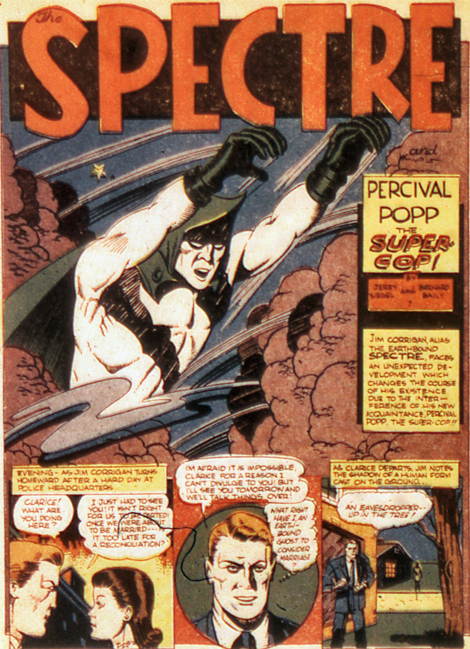 The Spectre finally gets fed up with it, and takes Percival off to a different planet to threaten him, but that does no good. Percival decides to hone in on Clarice Winston in an attempt to get closer to Jim. 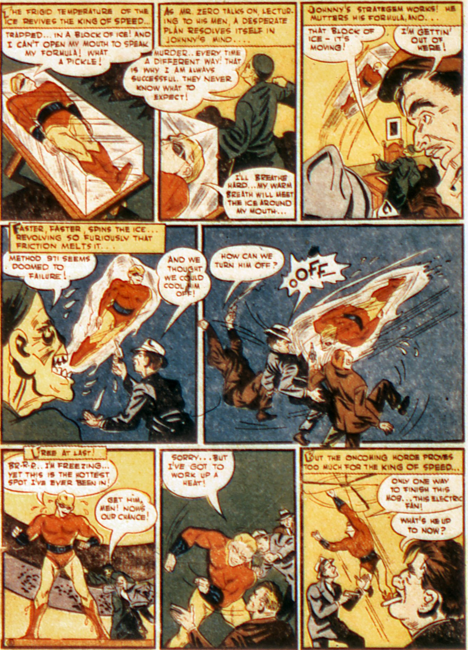 Clarice winds up in a coma, Percival thinks it has to do with a statue, but the Spectre realizes Percival is going to be diving near his corpse, still sitting on the bottom of the harbour. 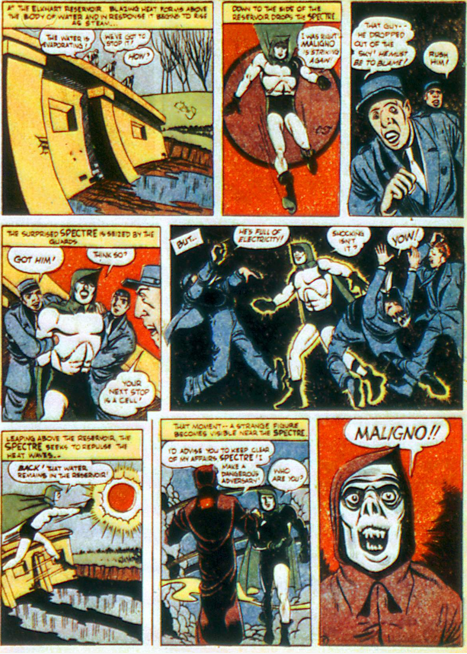 The Spectre goes to the Voice, who returns Jim’s body to life, with the Spectre now residing inside it. He saves the day, and Percival’s life, and ends cuddling with Clarice. 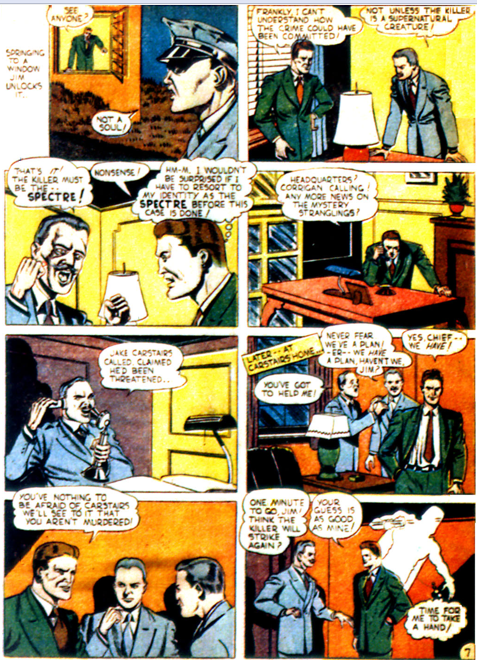 It’s questionable whether Jim Corrigan really returned to life, or the body was simply freed from cement, and the Spectre force allowed to possess it, and have it act independently. This story was completely ignored in the Ostrander/Mandrake series, in which the body is still encased in cement in the harbour. The Dr. 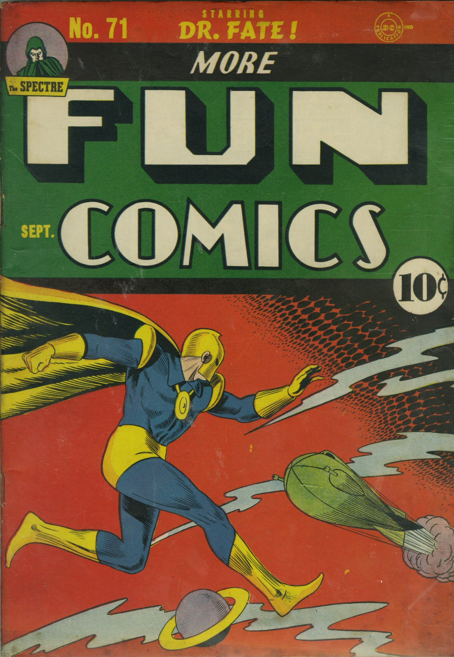 Fate cover to More Fun 72 (Oct 41) is notable for two reasons. 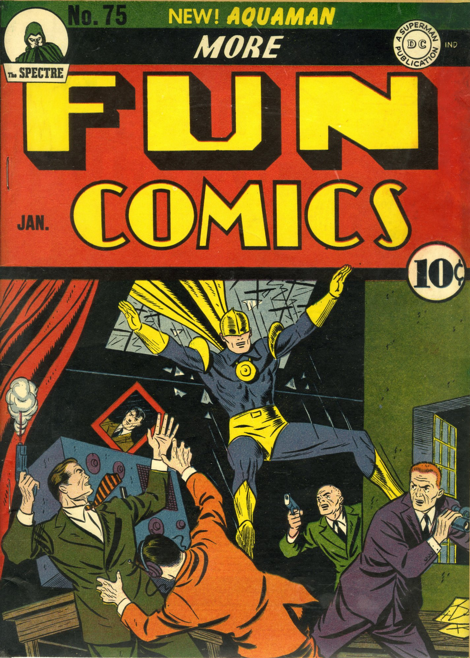 Firstly, it debuts his half-helmet, which he will wear for the remainder of his appearance in More Fun. 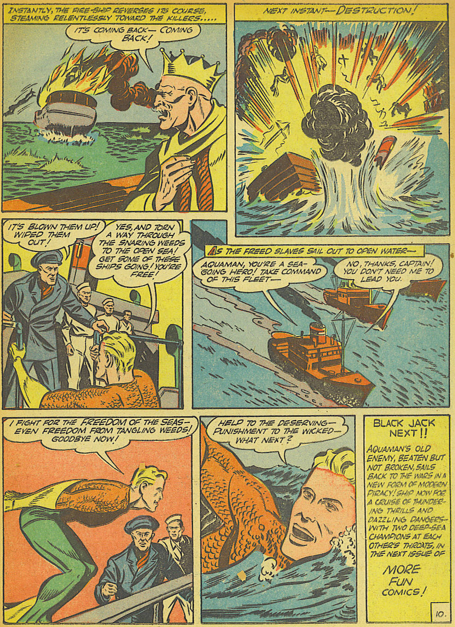 Secondly, it features him fighting a Nazi sub. 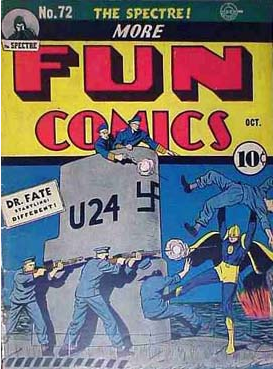 This cover appeared in mid-1941, before the US entered World War 2. 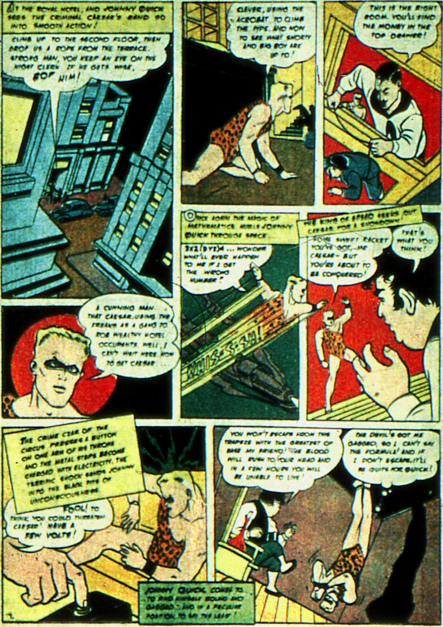 The story in the issue has no connection to the cover, however. 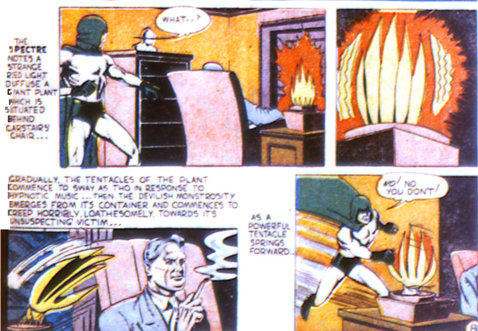 The Spectre is given a good enemy in this Jerry Siegel/Bernard Bailey story. A farmer named Hiram Spiezel opens a strange jar he finds on his land, and gets possessed by an ancient, malevolent, but unnamed, spirit. Spiezel becomes a financial shark, ruthlessly exploiting others and taking advantage of their problems. In other words, a banker. He also plots to control the world financially. In other words, an American banker. But the story does not mire itself in market manipulations. 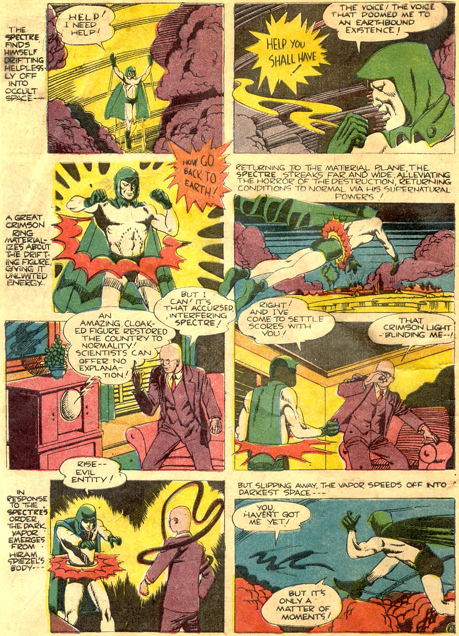 Once the Spectre gets involved the battle becomes more physical, and Bailey does some great stuff with the art, becoming metaphorical on Speizel’s actions. 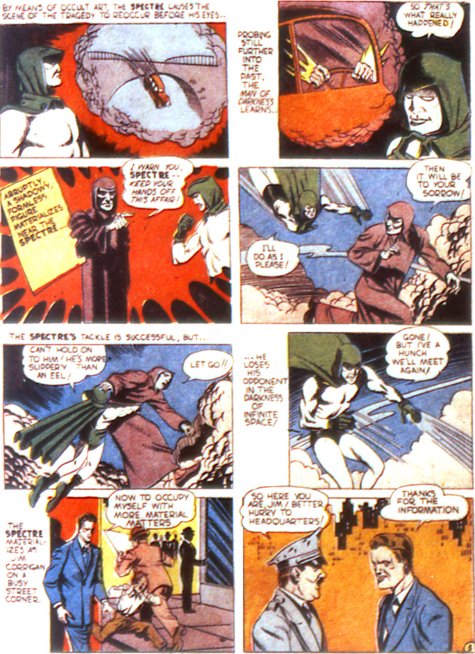 In order to defeat him, the Spectre goes to the Voice and asks for help. He is given a glowing red band around his hips, and with that is able to drive the spirit out of Spiezel, get it back in the jar and bury it on the ocean floor. But the thing that comes to my mind is, where is the Ring of Life? 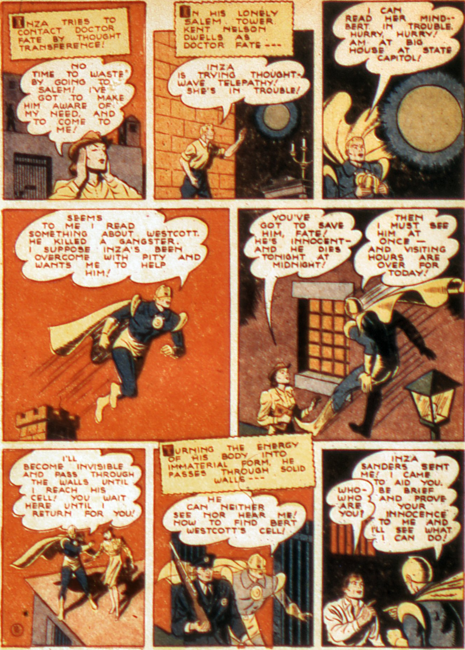 It’s absence without mention was not explained, until Roy Thomas filled in the gaps in All-Star Squadron. 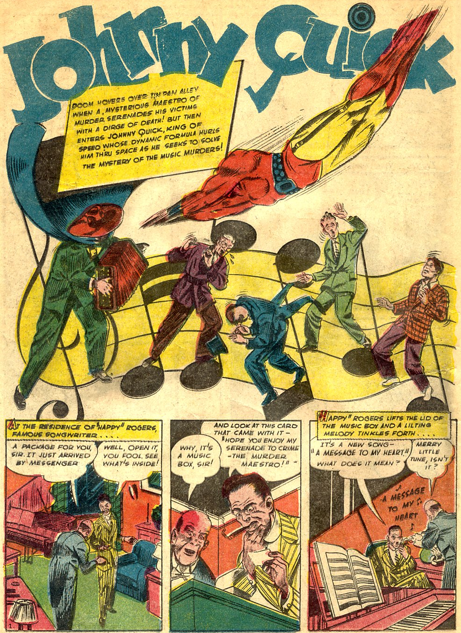 Johnny Quick solves a murder mystery among musicians in his second story. It’s a decent mystery tale, and the panel on the bottom of the musicians makes me think they might have corresponded to actual singers of the time? I only suspect that because of the one with the pipe, which was how Bing Crosby was always characterized. 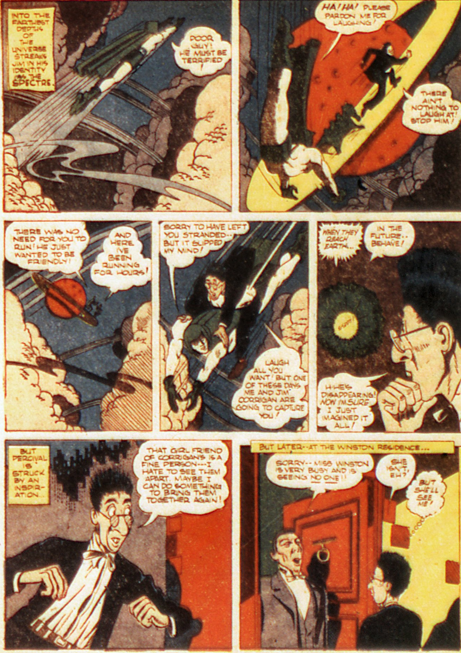 Although it is not stated, Johnny is clearly able to fly as of this story, a significant difference from the Flash. 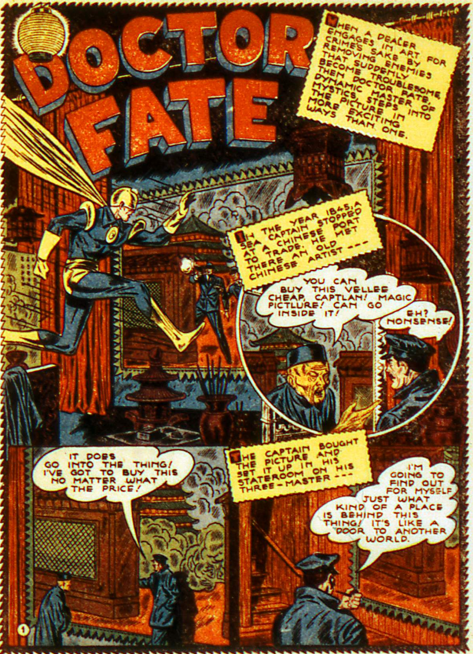 Dr. Fate’s story in this issue changes the helmet, and this slightly alters his never-well-defined powers. We also get to meet Inza’s family, who are farmers. That surprises me, because Inza has, up to now, been shown as a well-off member of urban society. 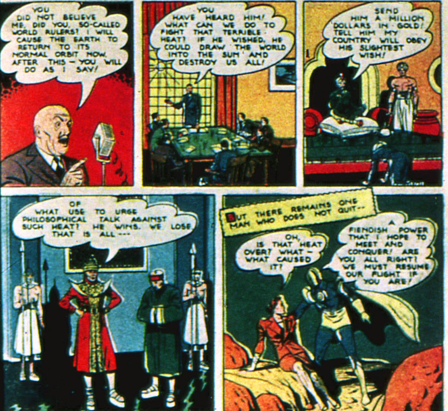 Gardner Fox and Howard Sherman also give Fate a ring he can use to view people, and the crystal ball makes an appearance again. 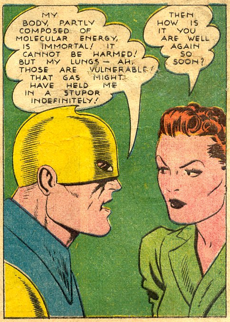 Now that he has half a helmet, he also appears far more often as Kent Nelson. He goes after some forgers, who have been taking advantage of the simple farm folks, including Inza’s grandparents. The forgers trap him and gas him, and it works. Because he no longer has his full helmet. He recovers and captures the bad guys, beating them into submission. He explains to Inza that his body is partly composed of molecular energy. I’m no science whiz, but isn’t everyones? 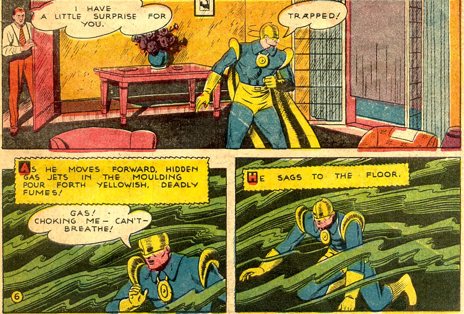 But the half-helmet leaves his breathing vulnerable. There is never any mention of the other helmet, what happened to it, or why he is now wearing this one. 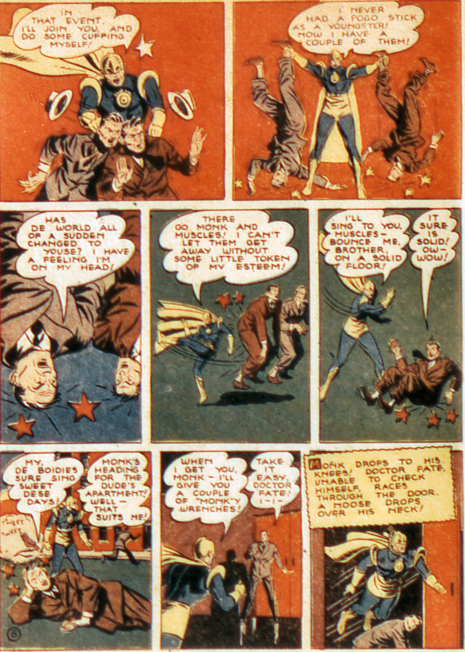 As with the Ring of Life, the explanation would wait until All-Star Squadron. Dr. 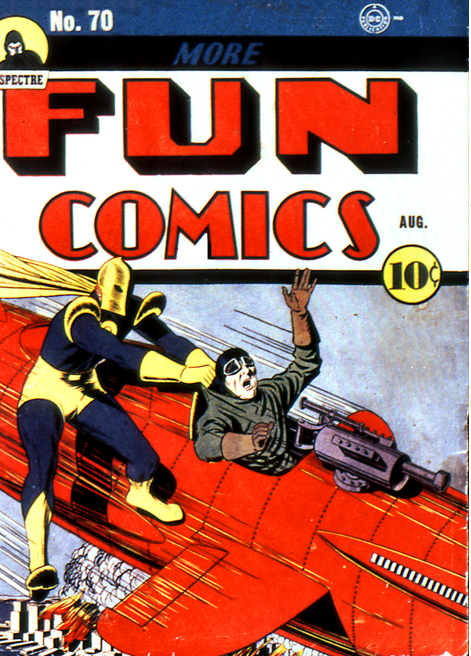 Fate is the cover feature of More Fun 71 (Sept 41), but moves back to the final slot in the book. 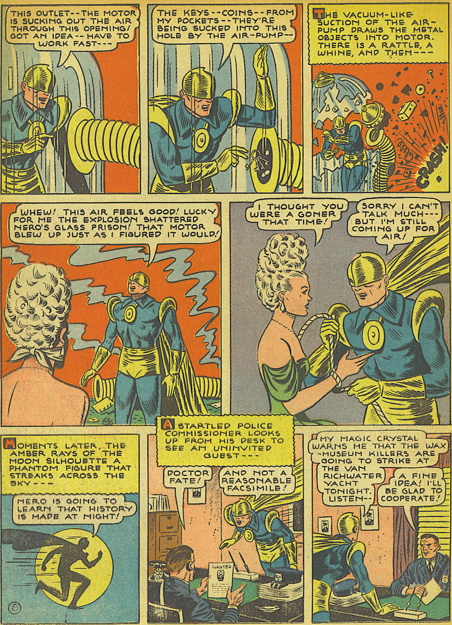 The character clearly had not proved as popular as expected, as this is the final issue where he wears the full helmet. His series becomes far less mystical for the duration of its run. 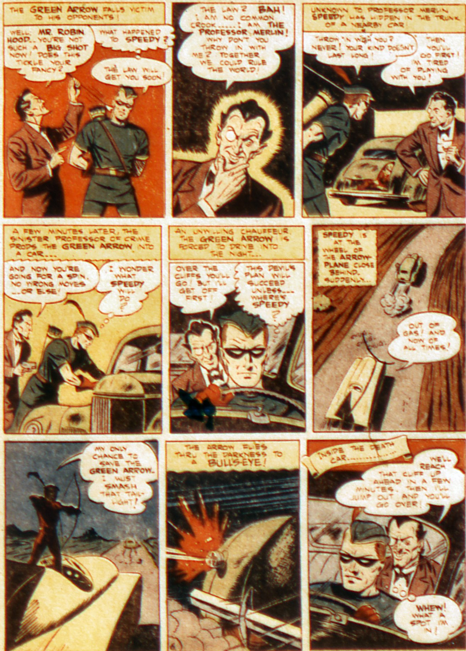 Jerry Siegel and Bernard Bailey’s Spectre moves back to the lead spot, although the story is nowhere on par with earlier adventures. This story all deals with confusion and chaos at a wedding. 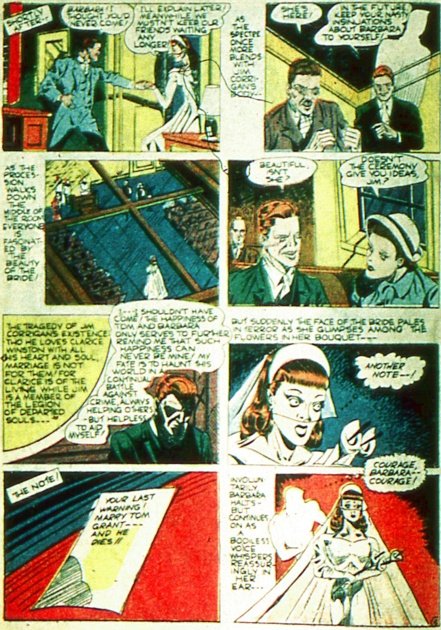 The groom is late, and a “rare cosmic event” decreases the Spectre’s powers, so he cannot use them to find him. He still can change his shape and take the groom’s place at the wedding though. 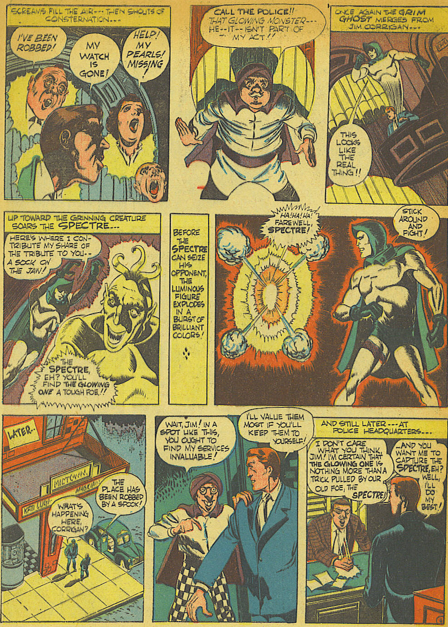 But the story almost descends into farce as Jim (as the groom) gets kidnapped, and the bride calls the wedding off, and the Spectre has to play matchmaker. The other really curious thing in the story is a scene with Clarice Winston, when she tells Jim not to let the ceremony “give him ideas.” Clearly she is no longer mooning over him. It’s surprising they are at the wedding together, if her feelings have cooled towards him so much. She hasn’t been seen in the series for a while now. 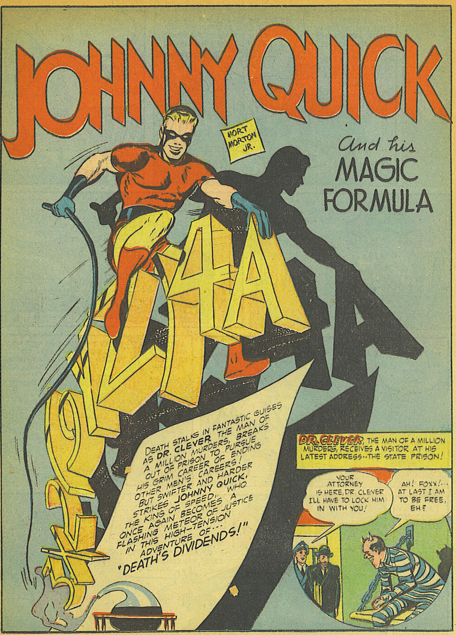 Johnny Quick debuts in this issue. 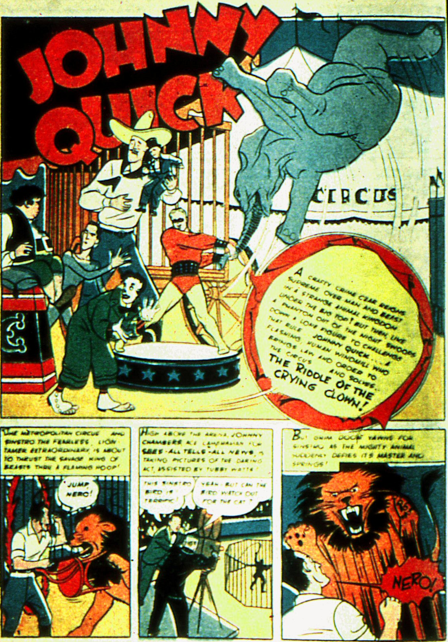 A newsreel reporter named Johnny Chambers, he and his cameraman, Tubby Watts, head to the circus to film, when a lion breaks free of its cage. 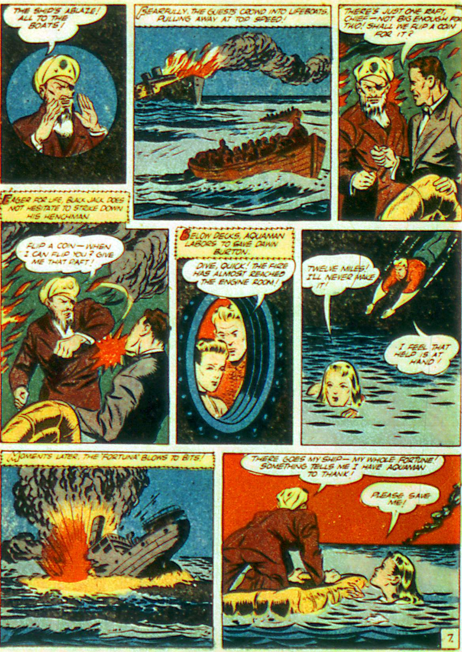 Johnny already has his powers when the story begins, and the flashback to his origin ascribes him some previous adventures as well. 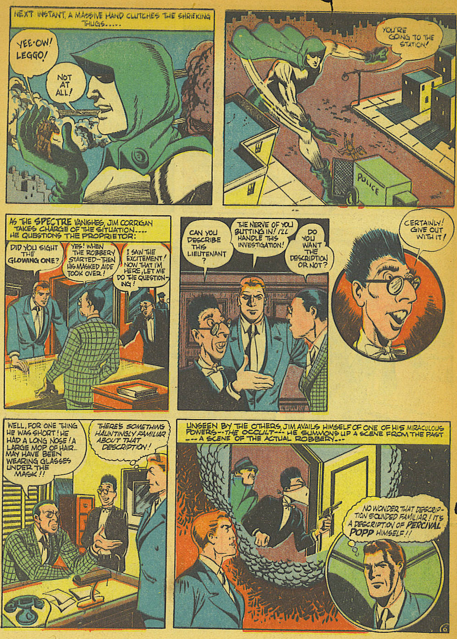 We see Johnny as a college student, and the professor who teaches him the “speed formula” he recites to gain his powers. 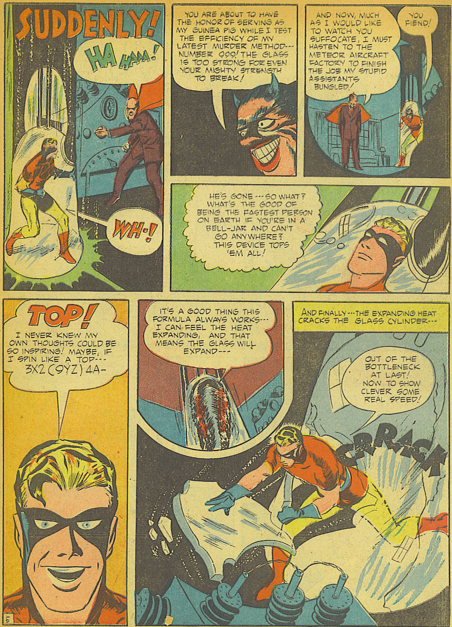 In this issue, the speed is shown the same way it is in the Flash series, and there is not that much to distinguish the two characters at this point, except that Johnny’s costume looks kind of crappy. 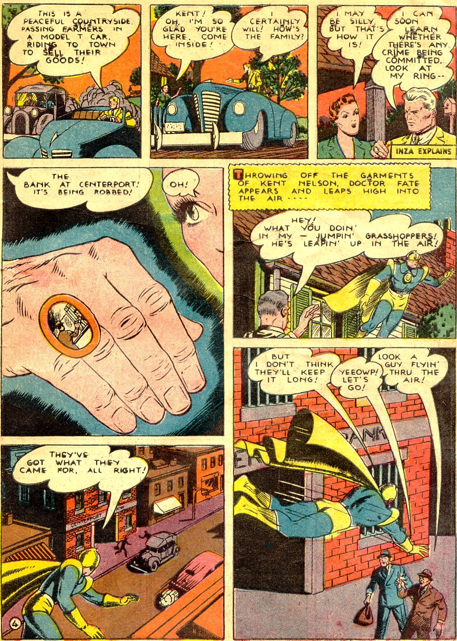 Johnny disguises himself as a strong man, infiltrating the circus and discovers that it is the front for a crime ring. 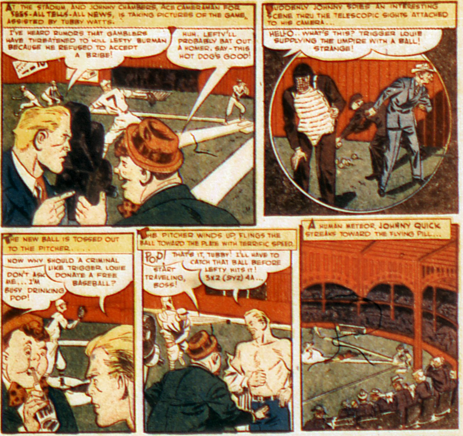 So many circuses are fronts for crime rings in 1940s comics. Makes one wonder just how often that really occurred. The last “full helmet” Dr. Fate story sees the Earth stop rotating, leaving half in baking sunlight and half in darkness. Inza is travelling in New Mexico at the time, and begs Fate to help out the people there. He uses his magic to create globes that will induce rain, which also has the effect of making the Earth rotate again. Because. It just does. There is a mad scientist behind it all, Adam Igorovich, who tries to blackmail the various countries. When that fails, he uses his machine to move the Earth closer to the sun, threatening to destroy it. Dr. Fate resorts to his fists again, beating the guy up rather that using magic on him. 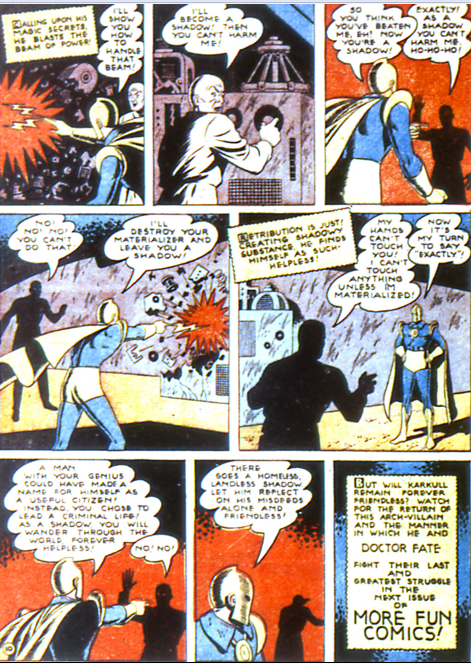 The scientist tries to kill Fate by blowing up his lab, but Fate zips away and the madman kills only himself. Ian Karkull returns in the Dr. 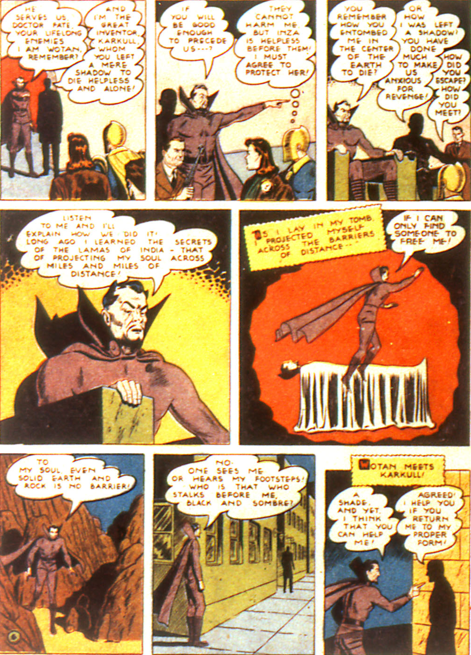 Fate story in More Fun 70 (Aug 41), teaming with Wotan. 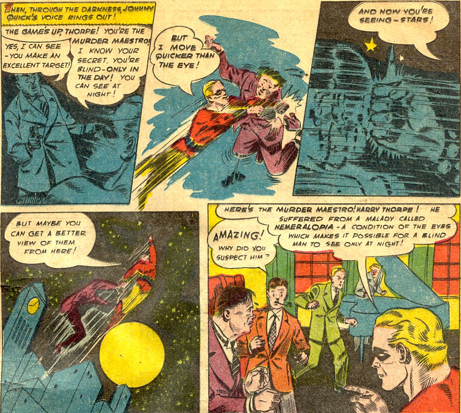 It’s still Gardner Fox and Howard Sherman, but some of the spark seems to have been lost. 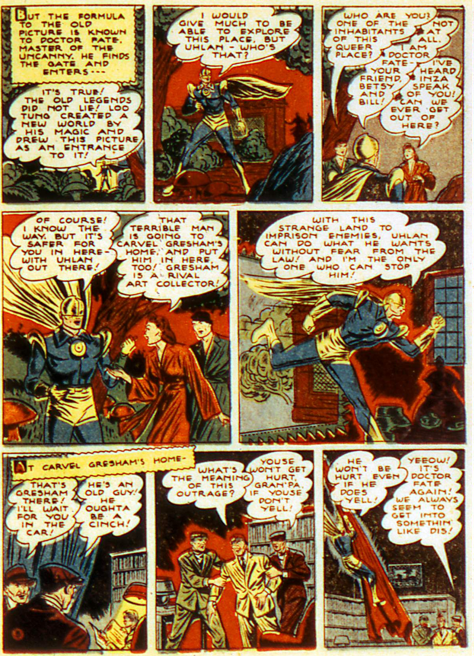 Villain team-ups were extremely rare in the 40s, so there was much to be excited about, although the story itself is a bit of a let-down. An arctic explorer, and friend of Inza, relates experiencing unusual winds on his last trip north, so Fate monitors his next trip using his crystal ball. It turns out Wotan and Ian Karkull have a base of operations up there. Wotan had mentally contacted Karkull, who freed him, and in return Wotan gave Karkull’s shadow form the power to touch and handle things. Sadly, Wotan’s skin seems to have had all the green leached out of it during his imprisonment. They kidnap Inza, but Fate does not let that stop him at all, and takes the two of them down fairly easily. They both appear to die in flames at the end of the story, though of course neither really did. 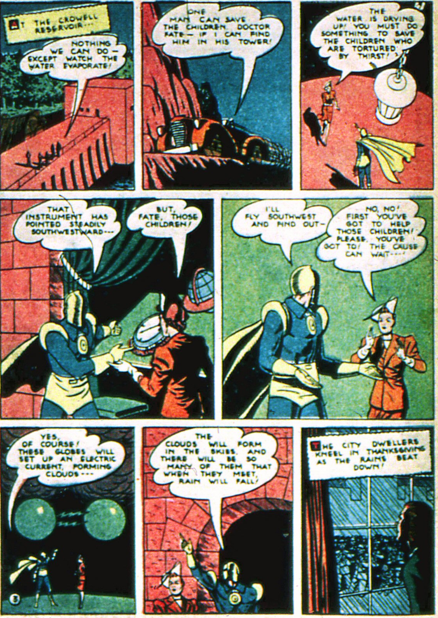 Even so, this marks the final Golden Age appearances for both of the villains. Both were next seen in the 80s, in All-Star Squadron. 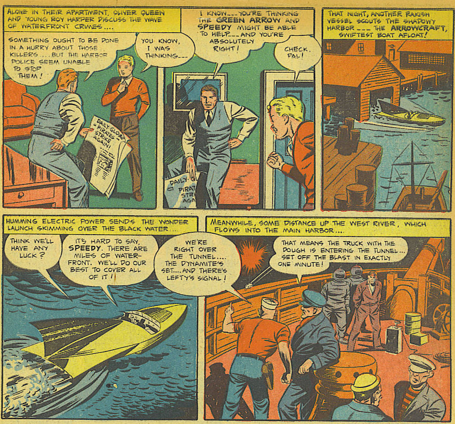 Lance Larkin’s series comes to an end with this issue. He is in Sumatra, as he has been for the previous two issues. In the previous stories he had come to the aid of Eve Normal and her father, and together the three started running a gold mine. In this tale they find themselves menaced by tiny albinos from deep underground, whom they call Owl-Men. 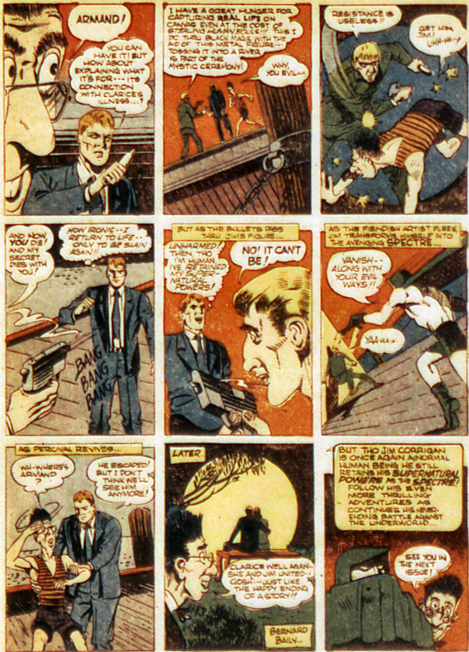 This is the first (and only) Lance Larkin story that pits him against anything not typically human. 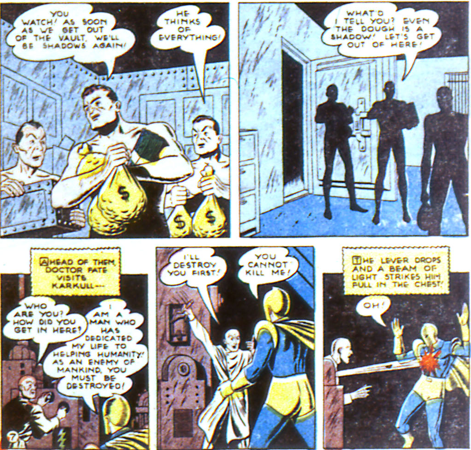 Lance defeats the Owl-Men, and also exposes the man they were working for. 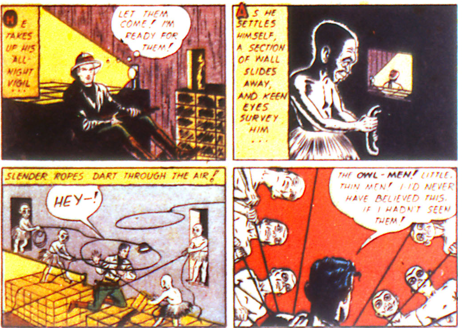 The Owl-Men are explained as beings that evolved deep underground, posibly perfectly adapted to work in the mines. As we never see Lance again, I assume he married Eve, and together they enslaved the Owl-Men to be their miners while living on the profits from this enterprise. At least for a year or so, before the Japanese invasion of Sumatra. Then Lance and Eve and her father got killed, and the Owl-Men went deep into the mines and were never again seen by humans. 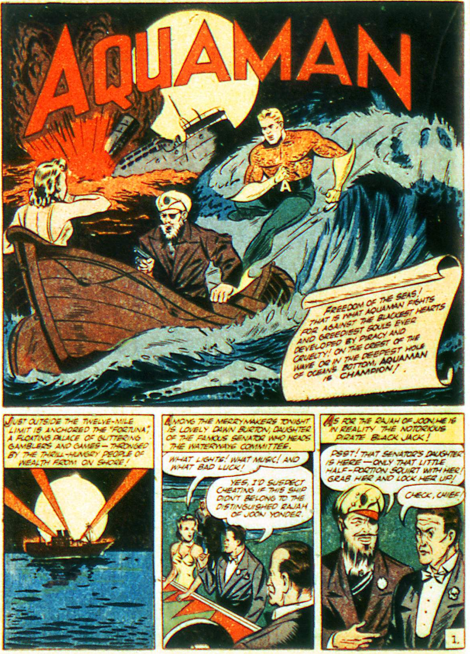 in this issue opens as a man drives off a bridge after complaining to his doctor that he was hearing voices, and Jim Corrigan is put on the case. He discovers the man was a part of the esoteric Crimson Circle Mystic Society. At first, this group appears to be a bunch of dupes in the hands of a skillful hypnotist. But it turns out the leader, Bandar, is actually a mystical entity manipulating these people into committing crimes for him. We know he is an evil spirit being because he wears the purple robes that ALL evil spirit beings wear in the Spectre series. 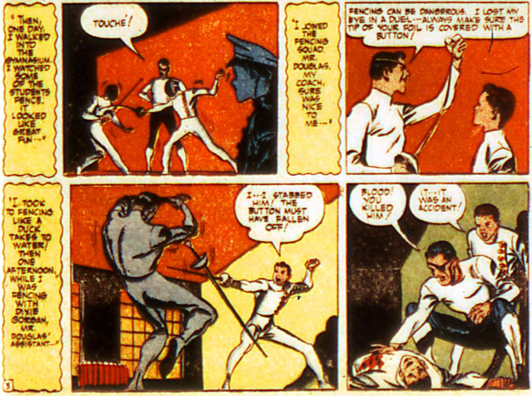 Bailey’s art is more dynamic than usual in the fight between the Spectre and Bandar, which livens up the resolution to this tale. 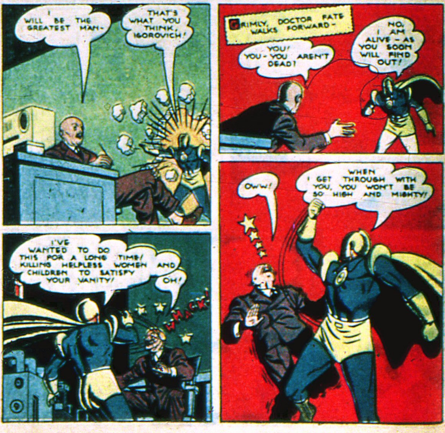 More Fun 69 (July 1941) sees the introduction of Ian Karkull, an evil scientist, and one of Dr. Fate’s few recurring foes, in a story by Gardner Fox and Howard Sherman. While attending a party with Inza, Kent Nelson sees a man get murdered by a shadow. Karkull has created a machine that can turn people into shadows and back to human. He easily assembles a criminal gang, who enjoy the freedom the shadow form gives them. Dr. 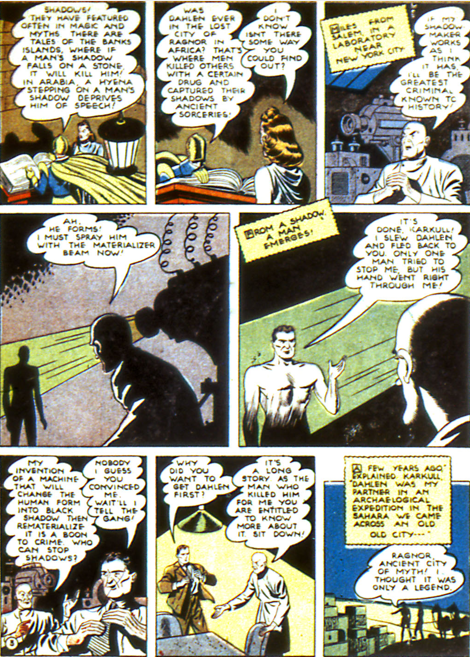 Fate tracks Karkull down, and the scientist tries to kill Fate with an energy ray, but only succeeds at briefly rendering him unconscious. Karkull uses the shadow machine on himself, but Fate destroys the device, leaving Karkull trapped in shadow form. 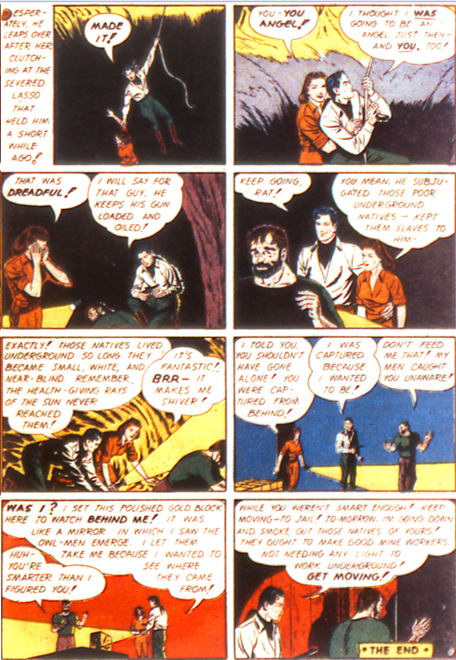 The story comes to an end this way, with Karkull bemoaning his situation, but the narrative in the final box informs the reader that, in fact, the story will continue in the following issue. 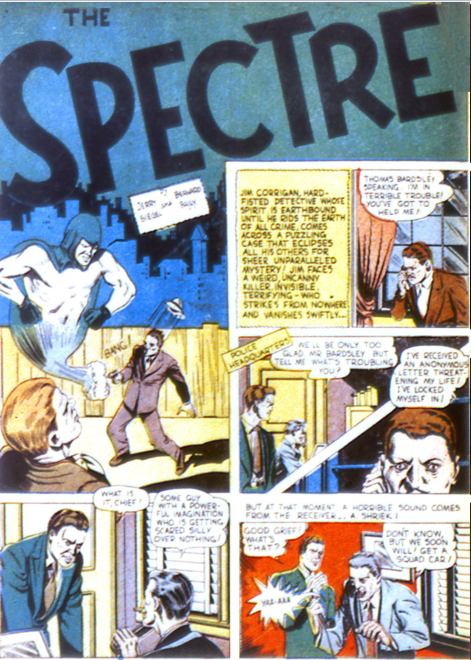 The Spectre story, by Jerry Siegel and Bernard Bailey, has Jim Corrigan and the Chief of Police receive a call from a man who has been threatened with death. When Corrigan gets to his house, the man is already dead, but in a locked room. 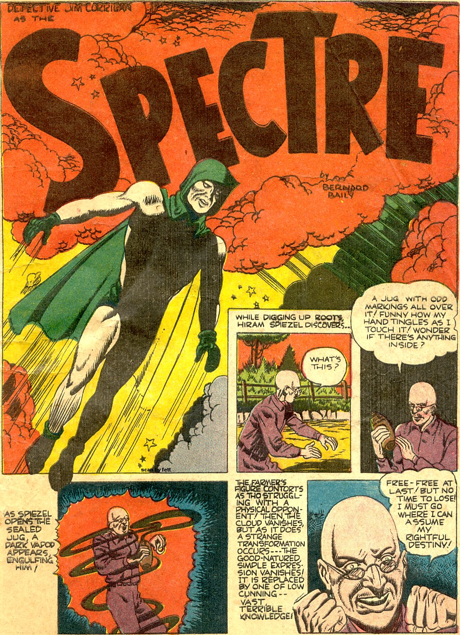 For quite a while, the Spectre series has used Jim only briefly, often just at the beginning and ending of the tales, but in this one he actually gets a larger role as himself than as the Spectre. 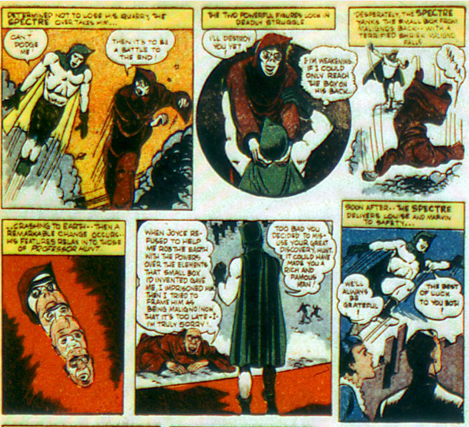 And the locked room mystery is actually pretty good, although it does take a silly turn as the Spectre is accused of the crime, based on nothing other than his ability to pass through walls. In the end, it turns out that killer plants are responsible. Bailey’s art is not quite up to the chore of making these look deadly. Or even much like plants. But a decent story nonetheless.